I think – I hope – that our gardens are becoming more lavishly and dynamically planted with perennials and grasses, and with an ecological bent. If so, this fall conundrum will only become more pressing. I see this decay as something beautiful, the way a steel panel becomes patinated with surface rust. So my approach to garden grooming in the fall is to remove obvious blight – shriveled hosta leaves, for example, along with diseased foliage – but to let anything else stand through the fall and winter as long as it isn’t an eyesore. Also, this debris is home to butterflies. 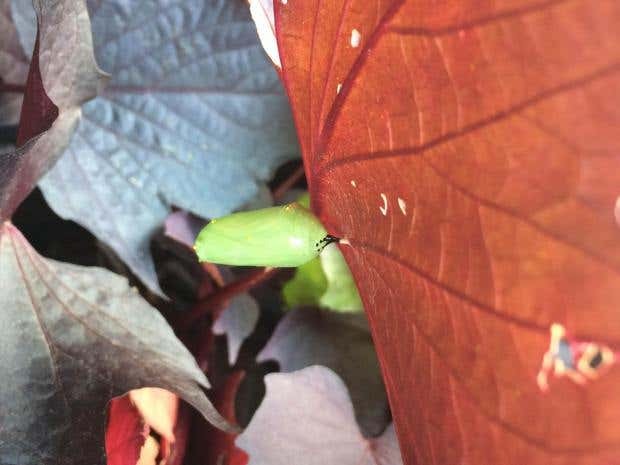 I was in the Smithsonian’s Ripley Garden the other day, and it was Grand Central for monarch butterflies – adults, caterpillars and even pupae. If it stays warm, the chrysalises will hatch soon and the butterflies will head south. But other butterflies spend the winter here in their cocoons, and the pipevine plants were loaded with pipevine swallowtail caterpillars eating their way into a pupal stage, to emerge as adults next year.